Robert (Bob) Ellsworth Jamison was born in Artesian, SD on September 10th, 1930 and died August 2nd, 2017. He was the oldest of 5 children born to Elmer and Faye (Moe). His family moved to Sioux Falls when he was 3 where he spent nearly his entire life. After graduating from Washington High School in 1949, Bob began his military service at 17 when he enlisted in the SD Air Guard as an aircraft mechanic. He was activated for service in the Korean War and upon his return was selected for pilot training. On December 26th,1953 he married the girl next door, and his wife of nearly 64 years, Shirley (Melvin). He served in the South Dakota Air Guard as a fighter pilot, squadron commander, Director of Operations and Chief of Staff. Bob had great enthusiasm for aviation logging 7,660 flying hours, in 14 different-types of military aircraft. He retired after 37 years at the rank of Colonel. Throughout his military career he received numerous awards and decorations including the Legion of Merit. He was a past President of the SD National Guard Association, lifetime member of the Veterans of Foreign War #628, past President of the Dakota Chapter Air Force Association, member of American Legion Post #15 and the past Chair of Military/Veterans Committee for the Sioux Falls Chamber of Commerce. Following his love of unique sports cars, Bob operated Jamison Imports from 1965-82, focusing primarily on MG, Triumph, Fiat and Jaguar sales and service. He enjoyed collecting and restoring cars. The rarer and redder the better! He completed restoring a Daytona Yellow MG-B, with the help of his sons, in the spring of 2017. Other business ventures include being a founder of Jamison Company Real Estate, Arctic Ice, Arctic Land Development and Site 2. Other lifetime hobbies included carpentry, fishing and hunting. Bob returned to school later in life and graduated from USD in 1982. He attended college with 5 of his adult children. The family joke was “You had to reserve a seat in the family car pool”, which by the way was a red Fiat. Bob began his long public service in 1989, serving first as a City Commissioner and then as a City Councilor for Sioux Falls until he retired in 2008. Bob had a remarkable path of service and stewardship. As he would say, “My folks had nothing, and my family has flourished in Sioux Falls; I owed something back to the community that has given us so many opportunities!” He was involved in numerous service committees and organizations including being a member, lector and usher at Christ the King Church for 60 years, 48-year member of the Sioux Falls East Kiwanis Club, and longtime member of the SD Municipal League. Bob’s legacy is that he was fair and reasonable in all dealings with the public; that he always did his homework and was fully informed. 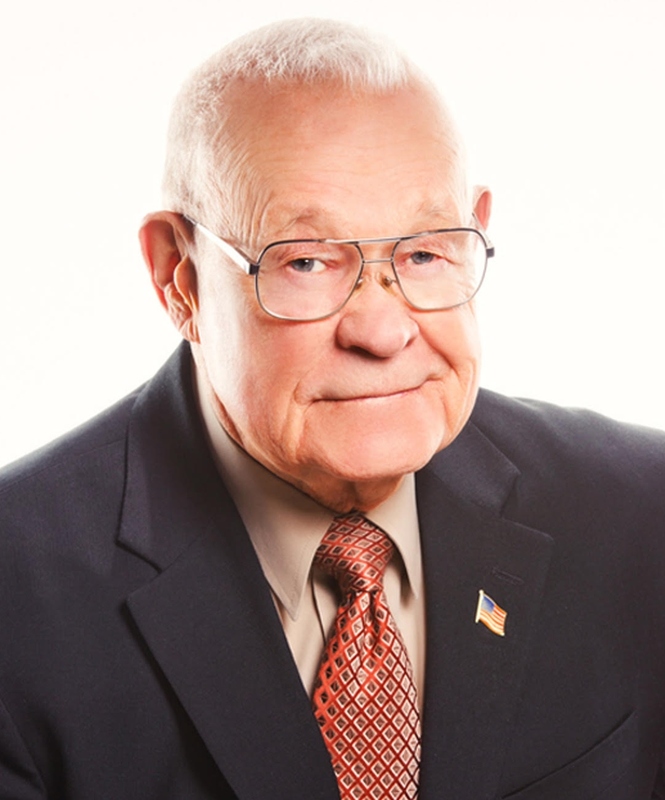 Known as a straight-shooter, Bob was proud to have served the citizens of Sioux Falls. Points of pride would be his leadership and involvement in the Washington Pavilion, the Convention Center, and the interchanges at I-29 & 26thSt and I-229 and Louise. He is one of the founding fathers of the Veteran’s Memorial Park and helped to facilitate the jointly funded City/County Siouxland Libraries. However, as respected as he was in the public sector, his family will remember him best as Dad and Grandpa. His role as family patriarch was one he cherished. He had the ability to gently guide his family, their spouses and children to bring out their very best. His vast knowledge on many diverse topics will be greatly missed by his family who have described him as teacher, advisor and guide. His humble nature was to say he was the jack of all trades and the master of none, but we all knew better. Bob was truly happy when either helping to design a new house or entryway or going hunting, fishing, or sailing with his family. To his grandchildren and great-grandchildren he will be remembered for his gentle hugs and for sitting in his lap hearing about their many daily adventures, His family will miss his laughter that would touch to your very core and the “magic” handkerchief for those pesky loose teeth. Bob and his wife Shirley were blessed with 9 children: Rick (Connie), Mary (Mark) Devish, Clayton (Jodi), Brad (Christy), Matt (Dawn), Bryon (Gail), Suzanne (Thom) Brude, Greg (Beth) and Randy (Kandy). All live in the Sioux Falls area, which is an additional blessing, as are their 24 grandchildren, 16 great-grandchildren and 2 great-great grandchildren. Bob is preceded in death by his parents, his siblings Clifford, Rozella (Hurtzel), Betty (Williams), and Howard and Bob’s son Clayton. Visitation will be Tuesday, August 8, 5:00 PM at Christ the King Catholic Church with a Scripture Vigil at 7:00 PM. Mass of Christian Burial will be Wednesday, August 9, 10:30 AM at Christ the King Catholic Church. Interment will be at Black Hills National Cemetery in Sturgis SD on a later date. Memorials may be directed in Bob’s name to: Veterans Memorial Park, c/o Sioux Falls Area Community Foundation (SFACF), 200 N. Cherapa Place, Sioux Falls, SD 57103.